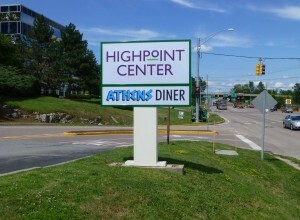 If you want to make a big impact, nothing catches your customer’s eye like a multi-dimensional sign. We specialize in creating traffic-stopping 3D signs that let your potential customers know that yours is a high-quality business, and convey a sense of permanence. The fastest-growing portion of our business is helping visitors find their way around a property, from the curb to your office door. These include curb-side directional signs, interior and exterior tenant directories, office suite signs and ADA-required room identification signs. For many businesses, lighted signs are a must to communicate both day and night. These include opaque aluminum cabinets with lighted letters and 3-Dimensional “channel” letters with LED lamps inside (either to light the face of each letter or to splash light against the wall behind it). A well-made sign with a poor logo is a sign with three strikes against it. We won’t let you waste your precious marketing budget on an ineffective sign. If you don’t have a logo we’ll create one for you, which can then also be used on all your marketing materials. We create and maintain all kinds of signs for property managers; everything from condominium entrance monument signs to parking lot and “pool rules” signs, all in a well thought-out and coordinated design. We create custom recognition displays to show the appreciation of nonprofits for major gifts.